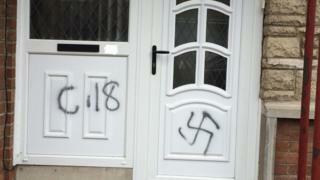 Hate crime against Jewish people in the UK increased by more than a third last year, with recorded incidents now at record levels, charity figures suggest. The Community Security Trust (CST), which monitors anti-Semitism, recorded 1,309 incidents in 2016 - surpassing the previous high of 1,182 in 2014. Mark Gardner, from the CST, said anti-Semites currently felt "emboldened". Home Secretary Amber Rudd said the government was providing £13.4m to increase security in Jewish areas. The CST, which works with police to gather data, said recorded incidents last year had increased by 36% on 2015. More than three-quarters of all recorded incidents took place in Greater London and Greater Manchester, where the two largest Jewish communities in the UK are located. In Greater Manchester, there had actually been a 9% fall in the past 12 months, with 205 incidents being reported in 2016. Mark Gardner, from the CST, said the increase could be partly explained by a greater willingness to report incidents to the police. However, he said: "Racists, including anti-Semites, feel emboldened, feel encouraged, at this moment in time, for a whole range of reasons, to come out with their hatred. "They used to keep it under the ground. Now they're coming out. A lid has been lifted off." The CST, which has recorded data since 1984, said a perceived increase in racism and xenophobia following the EU referendum and greater discussion of anti-Semitism in the Labour Party could explain the rise. Ms Rudd described anti-Semitism as a "deplorable form of hatred". She said: "It is vital we ensure the safety and security of our Jewish community and this government will continue to do all we can to stamp out these vile attacks and encourage those who experience them to come forward." Communities Secretary Sajid Javid added: "Anti-Semitism must be understood for what it is - an attack on the identity of people who live, contribute and are valued in our society. Last year Labour held an inquiry into allegations of anti-Semitism in the party, following the suspension of MP Naz Shah and ex-London mayor Ken Livingstone. Labour's deputy leader Tom Watson said the findings of the report were "extremely distressing", adding: "We must root out anti-Semitism whenever it takes place and wherever it exists, as a party and as a country."